Yemen has been a key-actor in the War on Terror throughout the 2000s. It is a complex country, too often trivialized by statistics focusing on its inconvenient position as the youngest and poorest country in the Arab world. Working on the most updated economic, social, political, and strategic data, the authors bring to the attention the new scenarios after Saleh’s era, in which Yemenis are called to rebuild their country and outline a new national pact for the future. The results of this research (supported by the Italian Ministry of Foreign Affairs) give also a chance to overcome political stereotypes in Arab countries. 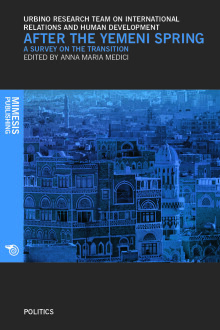 The panoramic view on Yemen displayed in this book helps the reader access the core issues that the current dialogue on reforms will unavoidably deal with, as well as the knowledge concerning the new political phase and the role of Yemen’s partners, including Italy. Anna Maria Medici teaches History of the Arab Countries, University of Urbino, Italy. URT-IRDH The Urbino Research Team on International Relations and Human Development is an integrated research team of the University of Urbino “Carlo Bo”. It promotes interdisciplinary and interdepartmental communications on subjects concerning international relations and human development.